More than likely you're seeing this page due to a misdirect somewhere. Click here to go to the main page of the Sailor Senshi Sanctuary, enjoy your visit! Sailor Senshi Sanctuary is the premier resource for a general introduction to all things Pretty Solider Sailor Moon. The Sailor Senshi Sanctuary is a great place for an introduction to the characters, image archives, information, and more. The Sailor Senshi Sanctuary is divided into areas, of which a Senshi resides in each. We also feature the full archive of Sailormoon related console video games and a large assortment of multimedia features. Since 1999 Sailor Senshi Sanctuary has been the premier source for a general introduction to the anime series Bishoujo Senshi Sailormoon, bridging the gap between the US and Japanese counterparts. In operation for over ten years, Sailor Senshi Sanctuary looks back to the era of fan made Sailormoon sites of the mid to late 1990's. Most of this site is as how it was back during that mythical time at the turn of the last millennium - when webspace was free and a bunch of 16 year olds at keyboards ruled the world. Sailor Senshi Sanctuary is always updating, so check back often! Feel free to e-mail me with any questions or comments you may have. Have fun and shoot me an e-mail! Thank you for visiting Sailor Senshi Sanctuary - your source for Sailormoon since 1999! 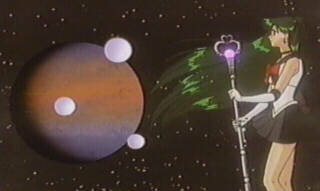 Sailor Pluto, do not permit you to enter this site. Sailor Senshi Sanctuary's new format requires that you have a frames compatible browser. Such as Netscape Communicator 4.5. The browser that you are currently using does not support frames. I, Sailor Pluto, will permit you to enter once you obtain a frames compatible browser.